El Nido was the second part of my weeklong whirland adventure in The Philippines. After some of the what seemed like the craziest travel days of my life (read: arguing with some crazy passive aggressive white lady at the airport (i.e. traveling while black), going to the wrong terminal twice at Manila Airport and missing my first flight to Cebu). I was so ready to finally get to El Nido. I honestly didn’t want to take the long six hour drive but it was the most affordable way to get there and I ended up enjoying the views along the way. The driver, Ryan, a tall handsome pinoy fella with dark hair and sunkissed skin led me to the van and asked if I wanted to ride shotgun. I almost said no until he said there was a phone charger in the front. I’m glad I said yes (not only because of the charger) but because I basically got a front row seat to six hours of seaside views across the island. We whisked throw seaside towns passing ma & pop shops along the way and I learned a lot of driving in The Philippines since I was riding shotgun. Side note: I have never seen such polite drivers in my life. Seriously. No one ever beeped their horns in frustration or gave anyone else the middle finger for cutting them off. It made me wonder what it’d be like to live in a world without western road rage - ahh the joy. When I booked this trip I was a bit trigger happy. I found the deal online ($500 USD from London to Manila), cashed in my credit card rewards points and starting shopping for cute bikinis. In my excitement, I completely overlooked how much time -and money- it takes to actually reach El Nido. Most people will fly into Manila which means that El Nido is either a short one hour, very expensive plane ride away or a long-winded multi-city 6 hour van ride away. The fake rich gal in me wanted to hop on that flight but the cheap broke college student that I actually am said otherwise. So I opted to spend a few days in Cebu to break up my domestic travels. From Cebu, I took an affordable flight with Cebu Pacific to Puerto Princesa. Originally, I bought a flight from AsiaAir for $60 USD (but that’s the flight that I missed). After landing in Puerto Princesa ( the smallest airport, ever), I waited for about an hour and then I was picked up by an El Nido transfer company, Daytripper to make the six hour drive to El Nido, Palawan. I highly recommend using Daytripper if you plan to drive from Puerto Princesa instead of flying. They are a bit pricier than some of the other services available (Cherry bus is common which is similar to Greyhound) but I think Daytripper was worth the extra money. The van was comfortable, had a phone charging port available, I felt safe and we stopped for lunch at a really cool, local restaurant (lunch is not included). If you prefer to fly, the only airline who goes to El Nido is AirSwift but this option is typically $100+ USD. Palawan is huge and it takes a while to reach El Nido so we stopped midday for some roadside chow. The quaint restaurant was called Lasan-I Cafe and it’s located almost halfway between Puerto Princesa and El Nido. Get the pork adobo and spring rolls. Thank me later. I’ve dreamt of this place long before I even knew it’s name. If you’re new to this blog, you might not know why this trip to the Philippines was so special for me. My great-great grandfather was from The Philippines and although I never met him, I had a loving relationship with his daughter (my great grandmother, Rest in Peace beautiful) and my grandmother, too. Our family never had much connection to him or the country but it’s had a weird, looming presence in my life that I couldn’t wait to explore deeper. I was itching to know this place that had always lived inside of me. Since I was kid, I was always very proud to exclaim my Filipino ancestry to anyone who would listen. Being a Black American with no known ties to the African continent, I found a subtle joy in finally knowing where some of my family came from. I took a 23 and Me DNA test not too long ago (here’s a video revealing the results) and although I already knew about my Filipino ancestry, it was exciting to learn about some of the other components of my DNA. The whole DNA test thing is a weird one - eh? Europeans stole us from our land, forced us into slavery in exchange for free labor and building a country that still hates us and now they’re charging us $100+ to find out where we came from?! It’s mad when you think about it that way. If you want to support a black owned ancestry company, check out African Ancestry. But I won’t lie and say that it doesn’t feel nice to know that I’m 18% Nigerian and 12% Ghanian. WOO! No matter which you dice it, I’m 100% black. El Nido is quite the tourist town. Although it feels authentic and local - the people there are well equipped for handling the tourist demand. In fact, El Nido is very strict about protecting the island and their environment. Plastic water bottles are banned on island hopping tours, all restaurants & bars use paper straws and there’s information everywhere regarding how to keep El Nido beautiful. With that said, there are plenty of lodging options to choose from in this beach town. I’m SO glad that I chose Spin Designer Hostel. I’m a student which means I travel on a serious budget. I can’t always afford to stay at fancy hotels and honestly I usually don’t want to (I used to work in hotels). Staying at hostels and Airbnb’s has always yielded me more memorable experiences (my Airbnb host in Marseille, France taught me a little French - you don’t get that in hotels) and a chance to interact with other travelers. So, because of my budget and desire to dive into the culture while connecting with other solo travelers, I chose the best hostel in town. Spin lives up to the ‘designer’ part of its name. From the moment you walk in, there are modern elements, sustainable wood furniture and decor that feels like you just walked into an island-themed Ikea. The Decor - This place is decorated beautifully. Shade but no shade, European hostels need to step their game ALL THE WAY UP. Spin is the first hostel I’ve stayed at in Asia but some of the other properties I’ve seen on Hostelworld in countries like Japan and Korea are always modern, chic and clean. I cannot say the same for a handful of the hostels I’ve stayed at in Europe. I literally had to leave a hostel in the middle of the night one time in Romania because it was sketchy and disgusting. Free Breakfast - Besides the fact that free is my favorite word, the breakfast here was actually really good and fresh. Every morning, I was up bright and early (hellloooo jet lag) for the 6 AM breakfast ready to devour the deliciousness. Breakfast is another area where European hostels typically lack but at Spin the options were endless. 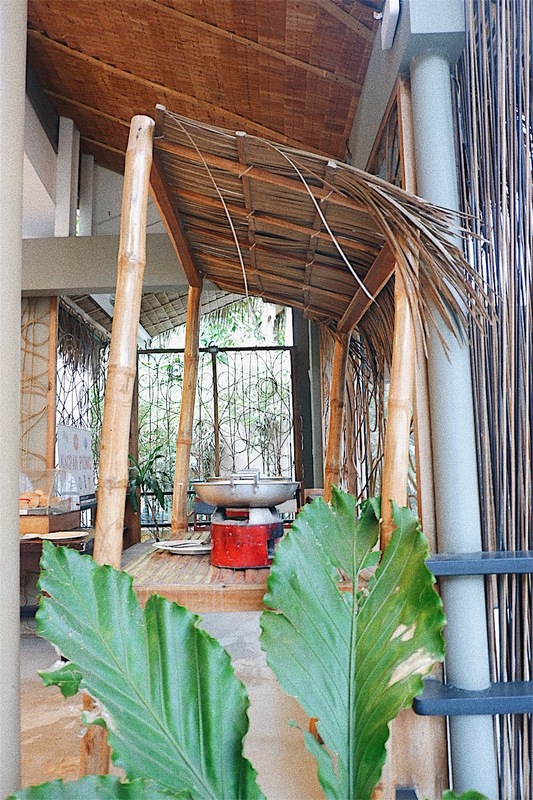 I’m talking sweet sticky rice wrapped in a banana leaf, rice, spiced pulled meats, breads (with jam), fresh fruit (pineapple & watermelon to be specific), coffee, thick& fluffy pancakes AND an omelette station. I seriously couldn’t believe that all of this was included. On top of that there was freshly squeezed juices. YES. Fresh OJ is the way to my heart. I stayed in a private room with a bathroom (it was my birthday so I wanted to ‘splurge’ a bit) for 3 nights and paid $178 USD total (about 9,300 PHP). This was extremely affordable for the luxuriousness my private room offered. Most hotels in western cities start at $100/night so this was a bargain. If you choose to stay in their dorm rooms, it’s even cheaper at about 1,200 PHP/night ($22 USD). After hours of taking the 6 hour drive from Puerto Princesa to El Nido - I finally arrived. I made it to my lovely accommodation (check out my IGTV for a room tour) and was honestly ready to eat, go to the beach and sleep. As I was checking in, I mentioned to the lovely lady at the reception desk that I wanted to go to Nacpan Beach. She told me just how far Nacpan was and that I wouldn’t have enough time to make it there before sunset. Instead, she recommended Las Casbanas - the beach closest to El Nido Town Proper. At this point, I just needed a beach & food so I was down to check it out. I started flooding her with all the questions I had about this busy island town because well...she’s a local. While I’m asking one too many questions, our conversation is interrupted by a stout, brown fellow. They converse in the beautiful local language, Tagalog (although I’m not sure which dialect) as I stood there. Now I don’t know much Tagalog but I’m well versed in context clues & men lol. Something told me he must’ve overheard our conversation about how much it would cost me to get a ride to the beach. She comes back to our conversation and says “Mr... what’s your name again? Yes - he would like to take you to the beach, free of charge.” Indeed, my context clues & intuition never fail me. So, I asked how much time I had to get ready and ran off to my room, plopped my luggage down and got ready. He assured me that he was apart of the local fire department which was evident by their meeting happening in the hostels open-air lobby. Be smart when traveling solo & only take offers you feel comfortable with. Yes, I hopped on the back of a motorcycle of a complete stranger. Yes, I’m still alive. No, this ain’t a love story - he was old enough to be my daddy lol. Of course, he decided to take me everywhere BUT where I asked to be taken. Honestly, I’m so grateful that he did. We whisked through El Nido weaving in and out of traffic and around tuk tuk’s. First we stopped at a restaurant that his friend owned. It was literally called “Amazing Sunset” because of their location on the beach (not the beach I thought I was going too lol). It was stunning. There was one really gorgeous coconut tree lying across the sand and perched just above the waves. I’d honestly never seen anything like it. In that moment, I did wish I was with my friends or family so it was bittersweet but mostly sweet. While we were there on the beach ( I was having a mini photo shoot), my new friend pointed to a mountain that seemed light years away. “Do you wanna go there?” he said with a smile. I asked what was there and he told me his other friend owns a restaurant there with a beautiful view and that we’d have just enough time to get there to catch the sunset. I told him I was down and we hopped back on the bike and climbed the mountainside the ocean hugging us to the right. I felt the same feeling I had the first time I rode along the California coast only more intensified. There was something really freeing about the way my braids blew in the wind beneath the helmet and it was particularly nice to be on a motorbike and not restricted to the confines of a car. I was right there with the ocean. We slowed down as we approached the all-white restaurant. “Hold on” M. says over the loudness of passing cars. Next thing I know I’m contemplating life and my decision to get on this bike. This dude took me up a unpaved back entrance and up the steepest hill possible. The bike stalled a bit and I was like @god, don’t let me fall backwards off this bike. I’ve never seen a sunset this immaculate in my life. I am not exaggerating when I say that this is hands down the prettiest place I’ve ever been. The most gorgeous sunset that I’ve ever laid my eyes on was here. The sky was painted with orange and pink hues and in the contrast of the sun the most beautiful silhouettes of palm trees, small islands and distant mountains formed. Insanity. Because M’s friend owned the restaurant - ya girl dined for free. I ordered the pork adobo (totally want to make this dish at home). Chicken adobo is the national dish of the Philippines and rightfully so, it’s delicious. The pork was soaked in a vinegar glaze and served with white rice. We cracked open two Red Horses’s (the best beer I had in PH. It’s quite popular. Make sure to get the Extra strong one) and took in the sunset. I damn near cried at the sheer beauty of it all. After speaking with the owner for a bit, we headed back into town (only about 10 mins away from the center) to book my island hopping tour for the next day. Y’all know by now that he likes pit stops but this one was my favorite. We stopped on the street and tried ‘Balut’. Something I’d seen on all the travel shows about the Philippines but I honestly would’ve been too scared to try it on my own. Balut is developing bird embryo that is boiled. It’s a popular street food in the Philippines and you can find them being sold all over the streets of El Nido. You eat Balut by peeling back the shell and topping it with vinegar and hot sauce. I honestly really liked it but recommend not looking at it for too long before going in. The vinegar and hot sauce really help ease the taste lol. Remember M, the local who I told you about in the story above? Yeah. He got me a ‘free’ tour (still had to pay for scuba gear and the required environmental tax) so I won’t be necessarily reviewing the company I went with but moreso the tour itself. In all honestly, while I was there I learned that every single tour company runs the same tours and has a similar lunch included as well. They all also charge similar prices so its easiest to book tours through your accommodation or by just popping into one of the shops selling tours (which is nearly all of them). You might’ve read online or heard from locals that Tour A & C are the best. I did Island Tour C and it was in fact awesome. Although, I feel like you can’t really go wrong when you’re sipping coconuts, swimming in hidden lagoons and hopping around islands. On my next trip to El Nido, I’ll be sure to hop on Tours A, B & D but my time for this trip was limited. On Tour C you’ll visit five islands: Helicopter Island, Matinloc Shrine, Secret Beach, Star Beach and Hidden Beach. Honestly all of them were gorgeous. The water is an otherworldly turquoise and the rock formations seem larger than life. This tour gives you about two opportunities to go snorkeling. Secret Beach was very relaxing and a great place for pictures. I really liked the secret tunnel we left through at Hidden Beach. My favorite stop of them all was Matinloc Shrine. It has a beautiful shrine, castle-like building, panaromic views and so many photo ops. We actually ate a lovely grilled lunch underneath the shrine’s canopy. It was a wonderful change from the other tour stops because you can read about some Filipino history and the shrine itself. Like forreal?!? This is unbelievable. Matinloc Shrine Island Hopping Tour C.
You’ll need to climb a slightly steep rock formation to get to the top and there will definitely be other people up there taking photos. I can’t blame them the view is gorgeous. Hands down - my favorite island. Snapped these pics while our feast was being prepared on the boat below. A freshly grilled lunch was made for us including: rice, sautéed eggplant, fresh grilled fish, pork, chicken, different sauces and fresh fruit. I took these pictures with my Fuji mirrorless camera, a cheap tripod from Amazon and the Fujifilm camera remote app. The second picture was taken using the camera’s self timer and propped up on a rock. Motorbike shawty. Please ensure your helmet has a shield. A rock fly up and hit me in the nose right next to my eye while riding. If you decide to rent a motorbike in El Nido, be sure that the place you are renting room is actually authorized to rent bikes. The first shop I tried (walked in randomly) looked at me sideways when I asked about renting a motorbike. Just as one of the guys at the desk was about to say no another guy popped up saying that suddenly they did have bikes. There were no signs or pamphlets that usually line the shop storefronts in El Nido. Then, I asked if they had a helmet and he scrambled around looking for one before telling me there was no helmet available. I honestly believe that they were about to rent me one of their personal helmet-less motorbikes just to make a buck. I don’t blame them - you gotta’ do what you gotta’ do to feed your family - but I wasn’t about to get on that bike without a helmet. Just make sure they’re legit before renting. Remember to bring your drivers license or passport with you to give to the shop owner. I know that sounds scary but you have their bike so that’s not something they will mess with. They keep it as collateral. Personally, I would hand over my license first and only use your passport as a last resort. Also, please be sure to use the shield on your helmet because a rock flew up and almost hit me in the eye while I was riding. Don’t be like me. Please make sure that your motorbike is properly working before you take off. This is how gas is sold in The Philippines. I just wanna wear braids and bikinis forever. When I landed in El Nido, I knew that I wanted to rent a motorbike and hit the road to a faraway beach (Napcan Beach comes highly recommended although I didn’t make it there) or waterfalls. I decided to spend my last full day on the island at Kuyawyaw Falls. The falls were 50 minutes south of El Nido Town Proper. The best part is that the route was literally one straight two-lane road all the way to the Falls so it’s impossible to get lost. On the ride, I stopped to buy gas from a ma & pa shop along the rude. I realized that many of these shopfronts were on the frontend of people’s homes and this was a way for them to have their own businesses. The store I stopped at had a couple teens and an older guy working there and definitely seemed like a family business. You can also buy snacks and other roadside necessities. There are shops every few minutes along the road. Along the way I passed a elementary school with families picking up their children from the school day, a boy and girl playing along the road who smiled and waved at me - so cute! Inevitably, I turned a lot of heads as a flew down the road in this brown skin (many Filipinos in El Nido were brown like me which was beautiful to see) with my long Fulani braids trailing behind. I went into the main town square and rented a motorbike for the day. This is the best way to get to a faraway destinations outside of El Nido. Another other option is to take a tricycle (or tuk-tuk) but they are slow, old and best used for close distances. You might also be able to find a van transfer company or tour operator that runs trips to the falls. Like I mentioned this trip is only one road and then a left hand turn into the falls. When you arrive, there will be a sign on the right (if you happen to be coming from the other direction the straight is signposted in both directions) that says ‘Kuyayaw Falls This Way’. I’m not going to lie, i went passed the sign at first. It looked like a scary movie and was pointing down a dirt road. Also, Google Maps was telling me to keep going for another half mile. I quickly realized Google had failed me and the dirt road definitely led to Kuyawyaw. Kuyawyaw is a perfect day trip from El Nido. I spent about 4-5 hours here visiting the three waterfalls, jumping from cliffs, swimming and swinging in hammocks. My guide took me to all the waterfalls and allowed me to stay at each for as long as I wanted - there’s no rush. I loved that I had ample free time because most tours (like the island hopping tours) are on a strict time schedule leaving you with limited time to take photos and explore. There are three waterfalls here and you’ll visit them all. They are about a 10 minute walk apart and the last one has a very steep hill to climb in order to reach it. There are many ropes and trees to hang onto but you should be prepared and able to climb without assistance. The first waterfall is great for relaxing, swimming or just chilling. There was a family there enjoying a picnic so it’s very relaxed. The second is anything but relaxed because there’s two tall cliff jumping points. It was really fun and I highly recommend jumping once you get over your fear (they have life jackets if needed). The third waterfall is the most picturesque and it reminded me of the cenotes in Mexico. The water was cool and I spent a lot of time just floating there. Basically, all of the waterfalls are gorgeous and you need to take a trip to Kuyawyaw Falls. Top Tip: Tip your guides WELL. This ain’t America - 20 pesos ain’t doing nothing. I tipped all of my guides well above the ‘norm’ because they were all awesome and the exchange rate is in our favor (USD & GBP) so why not give them money they can actually buy something they want/need/deserve with? Shout out to my guide, Aprll, she was the best. Homegirl climbed those steep hills in flip flops meanwhile I was slippin’ and slidin’ all over the place. She was only 18 years old and has a big family. She told me about high school in the Philippines and how she decided to leave school and work to help her mom with her new baby sibling. April was the sweetest, so easy to talk to and such a highlight of this experience. Saan ang palikuran - Where is the bathroom? Kamusta Ka - How are you? Bonus travel tip: I didn’t have any big nights out in El Nido but I did get drinks at the cutest bar that played throwback hip hop & R&B all night. Check out SAVA Beach Bar for all the vibes and great cocktails! Oh yes, it’s located on the beach too so it’s real cute. There’s so much I could say about how amazing this trip was. I feel like I’ve accomplished a childhood dream of mine. The whole time I was there I honestly felt protected by my grandmother and her fathers spirits Honestly, it felt like a calling to be there (something unexplainable but similar to what I imagine it will be like to visit a West African country for the first time). I feel relieved that I finally made it and it reminded me that I have to keep going. Keep traveling. Keep creating. Keep writing. Keep connecting with people. This is what my life will consist of for as long as I am able. Forever an explorer and I honestly want as many black people to travel as possible. We’re beautiful and the world should witness our beauty but most importantly we deserve to see the world. Keep seeing the world y’all, by any means necessary. Planning a trip to The Philippines (or elsewhere)? I own a boutique travel planning company and we can help you plan trips to 35+ destinations. Start planning here.